Send a get well gift! 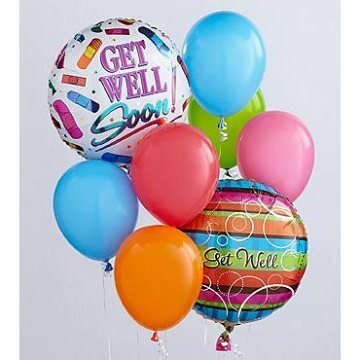 The FTD® Get Well Balloon Bunch. When you want your gift to make a big impression, give them this fun Balloon Bouquet. The bouquet arrives with 2 mylar balloons surrounded by 6 latex balloons and tied together with a ribbon. The get well mylar balloon designs will vary. Based on season and availability this selection may contain: pompons, alstroemeria, gerbera daisies, spray liatris and camellia with 2 mylar balloons (may vary from image shown) in a glass container. Our florists select the freshest flowers available so colors and varieties may vary.